Rural pubs are a key factor in village life and not just simply a place to drink. They not only provide a local meeting point and hub for the community, but also bring the community together from all walks of life. Danusia Osiowy finds out more about one Suffolk community who worked together to save the Duke. 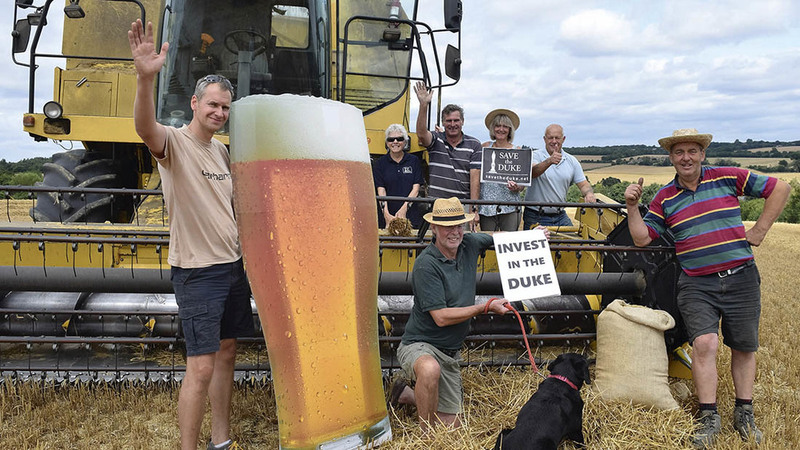 Farmers are often known for their involvement in local communities and no more so than in Somersham, Suffolk, where farming families have been the cornerstone of support for a campaign to save a historic pub. When the doors of the Duke of Marlborough closed on Christmas Eve 2014, local residents resigned themselves to facing the prospect their village pub would be lost forever. But just over two years and much campaigning later, the keys have been handed over to the new owners and they come in the form of the whole community. The previous owners had been looking for buyers for some time when they retired at the end of 2014 but with none forthcoming, it looked increasingly likely the pub would be de-licensed and sold for residential purposes. More than £300,000 was needed to purchase the oak-beamed free house. Local doctor Sarah Caston who hails from a local family farm was saddened by the prospect of losing the pub for future generations and called a village meeting to galvanise residents to save their local pub. “The Duke had been offering hospitality for well over 500 years,” she says. “We just wanted that to continue. Last September, the Save the Duke campaign committee launched a Crowdfunder page appealing for help to raise the money that was needed to buy the Grade II listed building. The minimum investment was (and still is) £250, which equates to five shares per person/organisation. Farmer and chairman James Batchelor-Wylam – Sarah’s brother in law – who later took on the role as chairman, persistently appealed to people across the region to help make things happen, not least because of a good financial incentive. Individuals who invested could take advantage of two generous schemes set up by the Government to encourage social investment. The first was the Enterprise Investment Scheme and the other Social Investment Tax Relief both offering 30 per cent tax back on investments made. Throughout the campaign, the region’s farming community have played a massive role in the campaign’s progress, including Sarah’s family who farm 263 hectares (650 acres) of arable crops in the village. Offering their barn as the local hub, the family put in a bar and staged a variety of fundraising events including Bash in the Barn and a quiz. One of the 12 committee members is Frances Brace who lives in the village and works in the pub and beer industry. She says: “The whole farming community has just pulled together. There is something about longevity and the way farmers view it. “Farmers just get it. They want to pass things down to the next generation to experience and the same rings true of the pub. The committee has met every Tuesday at James and wife Lucy’s farm to discuss their progressive, allocate tasks and complete a mountain of procedures to get them to where they are today. Surveys needed to be done on the build, PR literature designed and printed, legal advice sought, a website created, grants applied for, bank accounts created and endless administration completed. James highlights the importance of pus to agriculture, as well as to other local businesses and is especially true of the area. “The Duke of Marlborough lies in a fabulous barley growing area and within a stone’s throw of what is probably the country’s leading hop-propagation farm. Work is already underway to turn farmer Stephen Wright’s hops into a brew made specifically for the pub. Last year he hosted a community hop picking day where locals came to pick the crop before he dried them ready to distill for when the pub is up and ready. In October last year the committee had finally raised more than £300,000 and put in an offer to buy the pub, which was then accepted. They negotiated the purchase and now have the keys thanks to the 230 individuals and organisations who took a chance to save the historic building. About 80 per cent of that has been donated by the local community within a five-mile radius. The rest has come from neighbouring counties and even abroad. 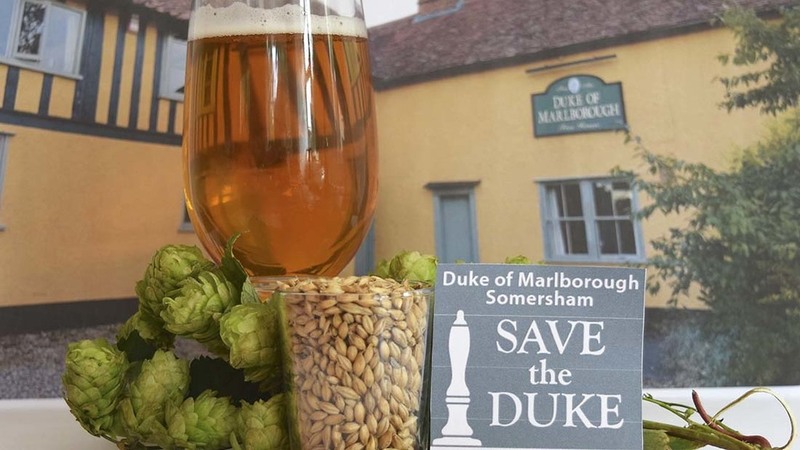 The Duke of Marlborough is now owned by Somersham Community Pub Ltd – the second co-operative pub in Suffolk – and is recognised as a Community Benefit Society. James says: "It is a massive thanks to the many, many people who have supported the campaign over the past two years. It has been a long haul and it’s true it’s been by the skin of our teeth and we’ll need more funds to get the pub up and running. Looking forward, the committee has a lot of work to do to get the pub open. Although the pub offers pretty, interior aesthetics, it has been closed for 26 months and immediate tasks are to redecorate, refit the cellar and tend to the outside landscape. The pub will open its doors on March 18 and will welcome shareholders and the local community to show investors what they have bought before its makeover. Just as important as the smartening up of the pub is the mission to find the right people to run it. Once open the pub will be run by voluntary workers until it gets an experienced management team to run the place professionally. “We will start off opening the pub three nights a week to serve drinks,” says Frances. “But we are a small, village community and 21 pubs are closing a week. “The only way we will survive is to be able to attract people from further afield who can come for a coffee, a drink or some home-cooked food and the fact we have a beautiful pub means it really has huge potential.